We have sunshine! We also have mid to upper 70 degree weather! I melt in anything over 75 so it is quite warm for me. 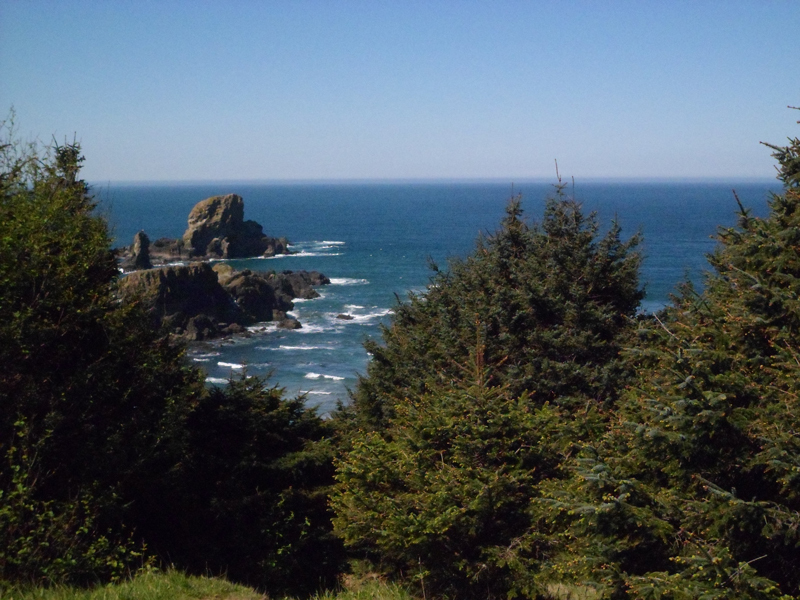 We went to Ecola State Park yesterday. Unfortunately the sunshine brings the strong winds. I spent about an hour trying to find a sheltered spot to paint on Indian Beach. Alas, the wind was blowing me and the sand around. It felt a bit like being in a sandblaster. I never even took my painting pack off. We decided to call it off and head home. On the way out of the park I spotted another road and we turned off to explore. I was determined to find a sheltered spot to paint. I found the spot above which is more sheltered from the wind. It was getting late so we decided to go back this morning. We packed up a lunch and Twill and drove up the coast. Cannon Beach is about 14 miles or so from our town. I got set up and got to work. 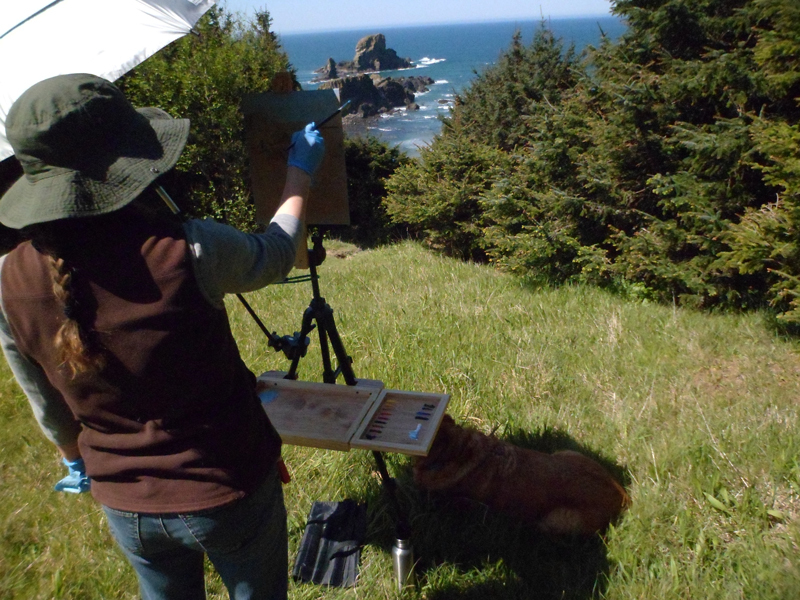 Here I am painting with my brand new Coulter Plein air set up. Today was the first time I used it and I have to say, I really like it. It is lightweight and easy to pack as well as super easy to set up. Twill insists on staying close by me. There was shade a few feet away under the trees but she made herself comfy in the shade from my easel. She had a big bowl of water to drink as it was quite warm. There was a bit of a breeze which kept me from getting too hot. I decided to paint a larger study. I have been painting very small for several months now and I thought it would be good to mix it up a bit and paint larger. 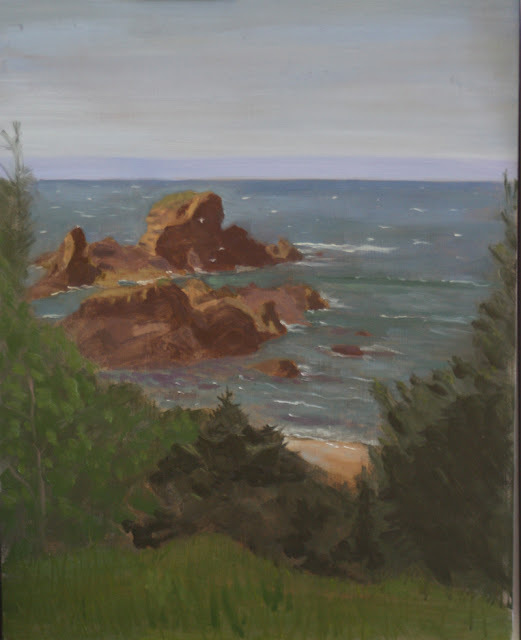 I am still pretty new to the whole plein air thing and have yet to take a class or workshop. I must admit, after today, I think it would be nice to take a workshop. I won't be able to do that this year but maybe next. Here is the finished study. I would like to paint a studio painting from it and post it on the Paint the Parks website. © 2013 R.L. Delight, Ecola State Park study, 11"x14", oil on gessobord. I haven't painted in the sunshine much, maybe three or four times so I am not used to the effects of sunlight. I had the umbrella on my easel as the sun was pretty bright. The colors of the rocks were not quite right. Also I put the trees in the foreground very quickly as I wanted to focus on the water and the rocks. It is a start and I will improve little by little. 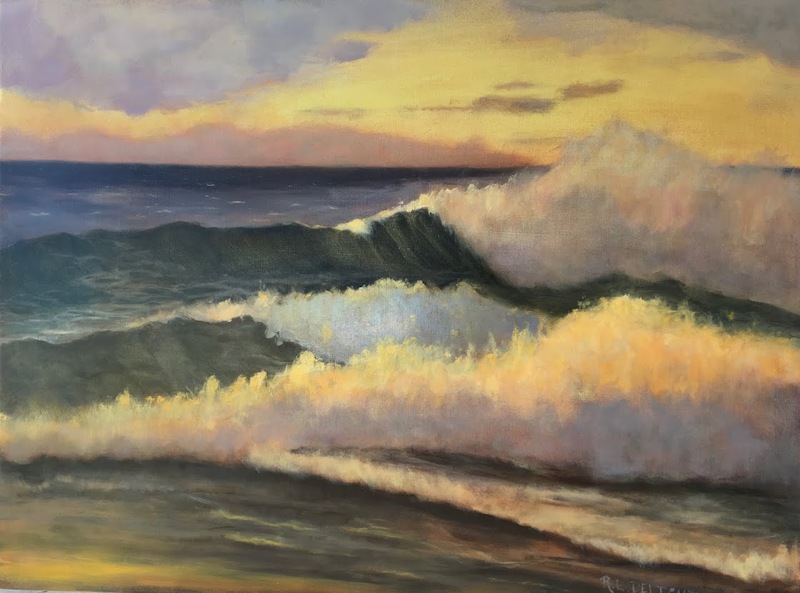 I will be painting more like the above this summer as the waves tend to be quite small and the sea fairly calm. I hope to get down the coast in July. We are supposed to hit 80 degrees this weekend. That is very hot for us. I know others would find that temperature a relief! I will be getting the chores done and everything set for another week of painting. Looks like an early summer. They called fire season on the mountains on 5/1 Very early. You should be cooling down soon though...what do they call your unseasonable heat..the Chetco effect?